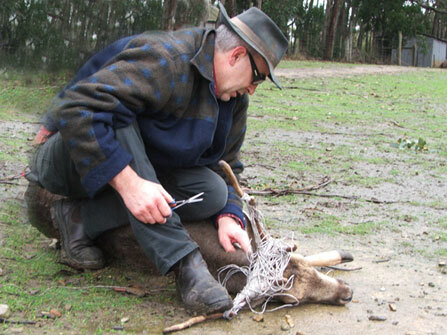 The fallow stag had somehow managed to get his antlers caught in electrical fencing twine. In his attempt to free himself, he shook his head back and forth and made the entanglement worse. A section of twine had wrapped around his neck and was starting to cut into his throat and it became critical to rescue the animal to remove the entanglement. He could not be easily approached in the large yard and he was a strong and potentially dangerous animal. Any attempt to capture him without sedation would have been risky both for the buck and for the rescuer. A dart delivered from a non-threatening distance enabled a safe capture and removal of the twine. The stag was up and walking within half an hour of the rescue.